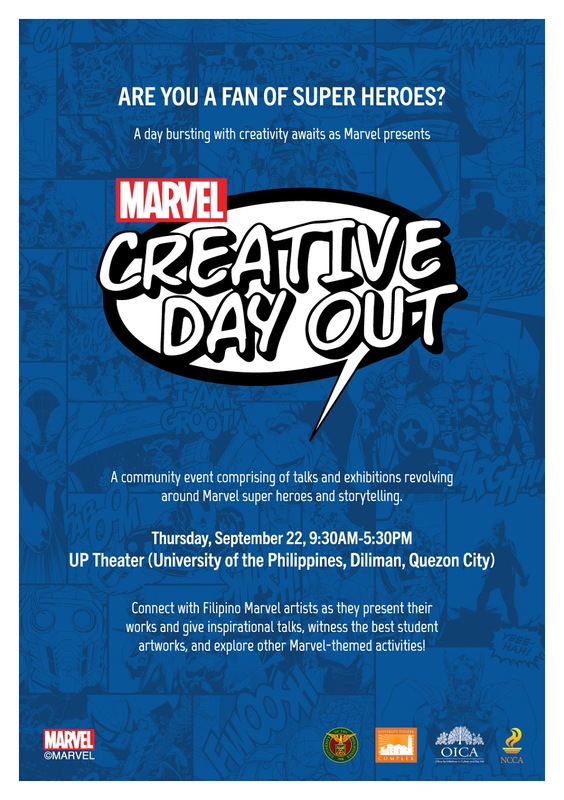 With the growing number of Marvel fans in the Philippines and the appeal of super hero-themed art, Marvel has initiated “Marvel Creative Day Out” – a full-day community event comprising of talks and exhibitions revolving around comics, fine arts, Marvel super heroes, and storytelling. Happening on September 22, 2016, at the UP Theater in University of the Philippines Diliman, Quezon City, Marvel Creative Day Out will bring together Filipino Marvel artists to share their knowledge and inspire the audience to continue evolving their craft. Some of the Filipino artists who will grace the event are Harvey Tolibao, penciller for Iron Man and X-Men, Mico Suayan, penciller for Moon Knight, Leinil Francis Yu, penciller for Secret Invasion and Avengers, and Stephen Jorge Segovia, illustrator for Wolverine and Thor. The event will also have Marvel Asia’s VP of Brand Development C.B. Cebulski discuss about the Marvel Universe and its standards when scouting for potential comic book artists. Apart from the inspirational talks from the Marvel artists, another highlight of the event is the exhibit of best artwork submissions from students all over the metro. This is the chance for young artists to share their original and unpublished Marvel-themed artwork to fellow enthusiasts, and personally consult featured Marvel artists for some tips as well. Guests will also get to witness live art, explore different creative booths of Marvel artists, and express their art in the collaboration wall open for all guests. In partnership with the University of the Philippines Diliman, the UP College of Fine Arts, UP Diliman Office for Initiatives in Culture and the Arts, UP Theatre, and National Commission of Culture and the Arts, the event aims to inspire creativity and encourage the younger generation of artists to keep evolving their craft and uplifting the Philippine art scene. The event is open to the public and entrance is free. Gates will open at 9:00 AM.